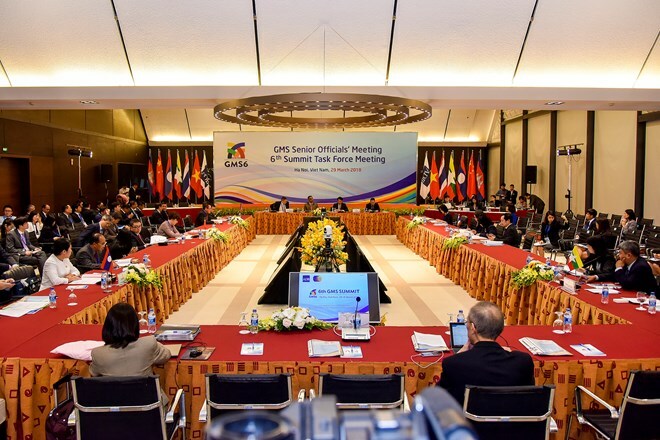 Hanoi (VNA) –Representatives from the Greater Mekong Subregion (GMS) began the second working day of the 6th GMS Summit and the 10th Cambodia-Laos-Vietnam (CLV) Summit in Hanoi on March 30 with a series of activities, focusing on crucial issues to the region. The most important event of the day is the GMS Business Summit, the first of its kind initiated by Vietnam, will serve as an opportunity for GMS leaders, head of international and regional organisations, representatives of development partners, business sectors and academia to share their views on key development issues of the GMS region and discuss ways to strengthen cooperation among different stakeholders. During the GMS Business Summit, there will be three concurrent sessions on infrastructure development and financing, agriculture business and technology, and GMS and global trade. A photo exhibition on GMS countries will take place in the presence of Prime Minister Nguyen Xuan Phuc. The Prime Minister will host a banquet for the GMS delegates in the evening. The GMS-6 and CLV-10 taking place on March 29-31 are among the biggest multilateral events hosted by Vietnam this year. About 2,000 delegates are expected to attend the events, including GMS leaders, and representatives from international organisations such as the President of the ADB, the Director General of the World Bank (WB), ASEAN Secretary General and representatives of the Asian Infrastructure Investment Bank (AIIB) and the Japan International Cooperation Agency (JICA), among others. Vietnam hosting the two events continues to affirm the country’s increasing position, as well as its role and contributions to regional cooperation mechanisms. This is an opportunity for regional leaders to discuss issues of shared concern on boosting investment cooperation, trade, ensuring security and using Mekong River water sustainably. It is also a chance for Vietnam to increase cooperation and connectivity, serving the country’s socio-economic development. The sixth Greater Mekong Sub-region Summit, themed “Leveraging 25 years of cooperation, Building an integrated, sustainable and prosperous GMS aims to celebrate the 25th founding anniversary of the GMS Programme and define cooperation orientations to build a region of prosperity, integration and sustainable development. GMS was established in 1992 as an initiative of the Asian Development Bank (ADB). The GMS Programme is the most complete cooperation programme that involves Vietnam, Laos, Cambodia, Thailand, Myanmar, and China’s Yunnan and Guangxi provinces. Meanwhile, the CLV-10 aims to review the implementation of the Master Plan for Socio-Economic Development of the CLV Development Triangle Area for 2010-2020 and discuss cooperation orientations in the coming time, especially seeking to increase the trilateral economic connectivity.